Occasionally, authoring a blog has its perks. Once, I got paid to participate in a survey about food and nutrition blogs. Another time, I got a free cookbook to give away. And, last week, I got some free healthy cereals to try. And not just the little sample-sized boxes. The full-sized versions. Score! I recently discovered DIET-FREE, a healthy lifestyle program designed by Registered Dietitian Zonya Foco, and I am a fan. If you want to get healthy while learning to embrace life and listen to your body, then this program might be perfect for you. Drink Water… and think before you drink anything else. Include breakfast… and stop eating two to three hours before bed. Eat often… and include a fruit or vegetable each time. Tame your sweet tooth… so you will naturally eat as little sugar as possible. Find the fat… and know the good, the bad and the ugly. Replace processed, chemically enhanced foods for wholesome, close-to-the-farm foods. Eat only until you are no longer hungry. Every day exercise… and make it your middle name. And, Zonya reminds us: every once in awhile, when the urge or circumstance dictates, it’s okay to live outside the guidelines of these habits! These are great principles; ones that I strive to live by. You rock, Zonya! To learn more about DIET-FREE check out Zonya’s website. And, for a convenient printable version of the eight habits, check out this DIET-FREE handout. Healthy: Unlike some other methods of cooking (such as boiling), microwave cooking allows foods like fruits and vegetables to retain most of their healthy vitamins and minerals. Additionally, microwave cooking very compatible with a low fat diet because food does not require the addition of excess fat to cook food. Environmentally-friendly: Microwave cooking is energy efficient! It conserves energy by only heating up the food within it, and not the rest of the house. Below are my favorite 10 healthy foods you can cook in the microwave. Bon appétit! Oatmeal: Oatmeal is my favorite breakfast food. Quick cooking oats, combined with low fat milk and chopped fruit, cooked for 4 minutes in the microwave make for a delicious morning! Try my Fall Morning Oatmeal recipe. Spinach: This nutrient-packed superfood cooks in the microwave in less than 1 minute! Try this 20 second recipe or my new favorite: top spinach with a little peanut vinaigrette (like the kind at Trader Joe’s shown here) and sprinkle with peanuts. Microwave for 30 seconds. Yum! Fruit “Cobbler:” This is one of my favorite heart-healthy desserts! Combine fresh or frozen bite-sized fruit pieces in a microwave-safe bowl (banana slices, apple chunks, blueberries, strawberry slices, peach slices, etc.). Microwave on high until fruit is hot and soft. Top with granola and fat free whipped cream. You’ll love it! Corn on the Cob: One of my summertime favorites. Place peeled, rinsed corn cobs on a microwave-safe plate, and nuke until cooked! (About 4-5 minutes per cob.) In Mexico, they squeeze fresh lime juice on corn rather than butter. Give it a try! Green Beans: Rinse green beans and microwave on a plate until bright green, about 1 minute per handful of beans. Fresh green beans are one of my favorite veggies- so much tastier than canned! Fish: Finally, an easy way to cook and enjoy fresh fish! 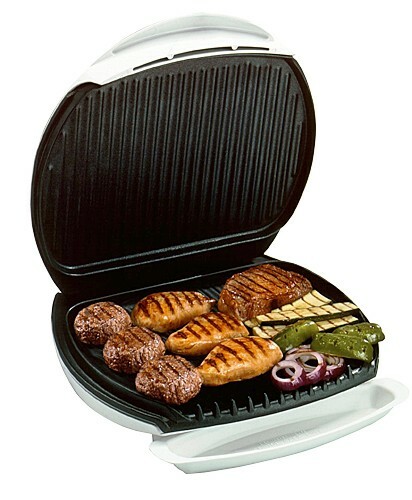 My favorite method is to cook fish for 1 minute on my George Forman grill, and then finish cooking in the microwave. Check out my easy recipe for Grilled Salmon! Popcorn: Did you know that popcorn is a whole grain? Choose a microwavable popcorn brand that is low in fat and sodium, and cook according to directions. Soybeans: Also known as edamame, soybeans are a delicious, protein-packed, fiber-filled snack! Buy frozen edamame in the grocery store, and cook in a microwave safe bowl with just a little bit of water until warm. Discard the water. Top with just a pinch of salt. If they are in the pods, pinch the beans out of the pods before you eat them! Whole Wheat Couscous: Couscous is a Mediterranean grain that is basically teeny-tiny pasta. Honestly, I usually cook it on the stove, but it is just as simple to cook it in the microwave. Heat 1 and 1/4 cup of water in the microwave until boiling. Add one cup of cous-cous, stir and cover. Let it sit for 5 minutes, and then fluff with a fork and serve. For a ton of couscous recipes, check out this Food Network link. Eggs: There are many different ways of preparing eggs using a microwave, but my favorite is poached eggs! Poaching eggs is a very healthy way to prepare eggs, because it requires no added fat. Here is a great video on how to poach eggs in the microwave. Which of these is a whole grain? The answer might be neither. The importance of eating whole grains is becoming increasingly apparent as studies continue to uncover the health benefits associated with whole grains. Whole grains have been shown to reduce the risk of stroke, heart disease, diabetes, eye degeneration, and cancer, to name a few. But which grains are really whole? Some food manufacturers are out to trick you. This article will help you to identify which foods are good sources of whole grains, and which are only posing as whole grains. First, a quick anatomy lesson on whole grains. A whole grain contains 3 parts: the bran, the germ and the endosperm. A refined grain (such as white bread and white rice) has the bran and the germ removed, leaving only the starchy endosperm. Unfortunately, the bran and the germ contain the majority of the fiber, vitamins and minerals. So when you eat a refined grain, you’re missing out on these nutrients! Now, lets do some detective work. How can you identify the real whole grains? These whole grain foods likely are not out to trick you. It doesn’t matter if they are quick-cooking, instant, or regular; they are still a whole grain! This is surprising to many people who think they must have slow-cooking brown rice or oatmeal for it to be healthy. Not so! Instant rice is “parboiled” meaning it’s partially cooked already. Quick-cooking oatmeal is just smaller than regular oatmeal, so it cooks faster. May NOT be a good source of whole grains! Cereal: The first ingredient listed should have the word “whole” in it, like “whole wheat,” “whole oats,” or “whole grain corn.” Ideally, it contains no refined or “enriched” grains in the label, and it also is low in sugar. 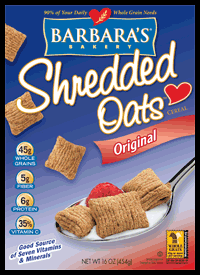 Post Shredded Wheat, Quaker Oatmeal Squares and Barabara’s Shredded Oats are some of my favorite whole grain cereals. Pasta: Most pasta is made from “durum wheat” which is not a whole grain. However, whole grain pastas are being offered more frequently in grocery stores. Barilla Whole Grain Pasta and Rozoni Healthy Harvest are blends of whole wheat and regular durum wheat. Other less common brands offer 100% whole wheat pasta: keep your eyes peeled! Crackers, granola bars, tortillas and other products: For these products, use the first ingredient method: make sure the first ingredient listed is a “whole grain,” and ideally the product contains no “enriched” grains in the label is low in sugar. Sometimes, these products will have a whole grain stamp that tells you how many grams of whole grains it contains. Compare this number to the total number of carbohydrates. The closer the 2 numbers are, the better; that means the product is mostly made of whole grains. Some of my favorite whole grain-containing products include Triscuts and Nature Valley granola bars. I hope this post will help you to identify some good sources of whole grains. What are some of your favorite whole grain foods? For a list of products containing whole grains, check out this site. and a crunchy texture. This is my favorite type of persimmon. Hachiya persimmons are heart-shaped. 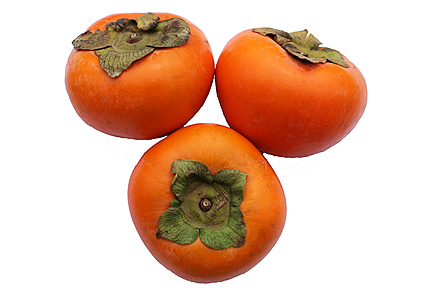 Hachiya persimmons are ripe when they are very soft, and are great for baking! Try adding Hachiya pulp to cookies, muffins and quick breads. If you cut a persimmon length-wise, there is a star shape in the middle! Persimmons are Japan’s national fruit. 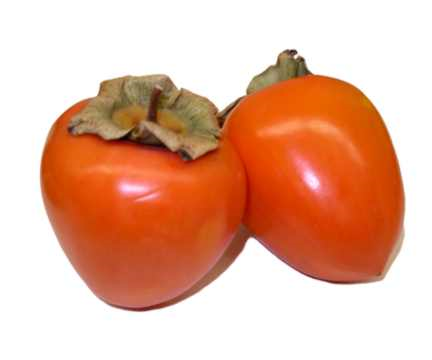 Persimmons are a great source of fiber and Vitamin A. Try my Fall Morning Oatmeal recipe, which is made with Fuyu persimmons!